This recipe goes to my MIL, because i have seen her adding pickle masala in all the veggie's which can be stuffed and cook. First time when i had gone to my MIL's place, she had cooked stuffed bitter gourd and that was tasting awesome with parathas. Then i asked her from where do you buy this masala, she said this masala is home made, that is nothing but a Pickle masala. I told her give me also this pickle so that even i will cook this kind of delicious stuffed veggie's.. She gave me 1 bottle of pickle and i have kept it safely, but that is also getting over i need to tell her about it. This pickle can be stored for more then 1year. I will definitely get this secrete pickle recipe from her and post it to all, so that every body can have a delicious pickle which can last for a long time..
Wash the lady’s finger well and dry on a towel until completely dry. Chop the crown off and make slits in each. keep them aside. In a large mixing bowl, add all the above ingredients and make a mixture. Then stuff the prepared mixture into the lady's fingers. In a pan, heat the oil and place all the lady's fingers. Cover and cook on a low flame till the lady's fingers are done (about 15 minutes). Remove the lid and allow to crispen. Mmmm ... It made my mouth water. Nice recipe & fantastic presentation. good looking okras with yummy stuffing ! I love this.. My fav.. Nice presentation..
Looks very yummy and delicious. Please get that pickle recipe ASAP. Looks fab and must have tasted good too. Makes me hungry instantly! Love the recipe! Nice tempting stuffed bhindi !! well presented !! Beautiful clicks dear..so tempting,makes me hungry. Wow! Achari bhindi - never heard of it Rumana! But totally love the idea as I love Bhindi and end up making the usual stuff for lack of ideas!! Now I know what to make :) thanks for posting your lovely comments on my blog! such an interesting dish! looks yummy! Wow...this sounds really yum, I always think to make and end up cooking with something else..I have to try this out soon. 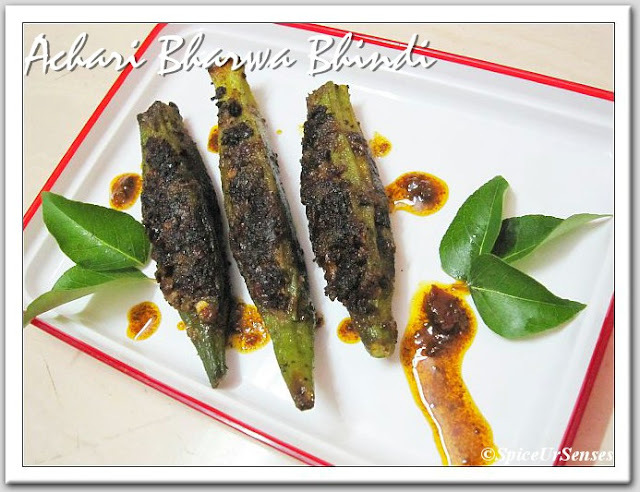 Acharai bhwara bhindi looks delicious and crispy and yummy. Unique recipe and looks yummy! I am not the biggest fan of ladyfingers (or okra, as we call it here) but your recipes sounds really delicious! How are you? I think this is one of your best recipes! So new for me! I love vendi in its all Avatar, so going to try it out. Shall I take out pickle masala from a ready made pickle bottle like Priya etc? or use fresh masala generally used in pickle? I was looking for a similar recipe. I had tasted it somewhere and it was very delicious. Bookmarking it. Lovely recipe, I would love to try this out sometime. Lovely recipe the stuffed okras look so tempting. Great recipe. Long back I made this. After seeing it want to make again. First time here and following you. Hope you will visit me too. Excellent! I love those stuffed ladyfingers. oh i can imagine the flavours...such a keeper of a recipe. looks delicious. 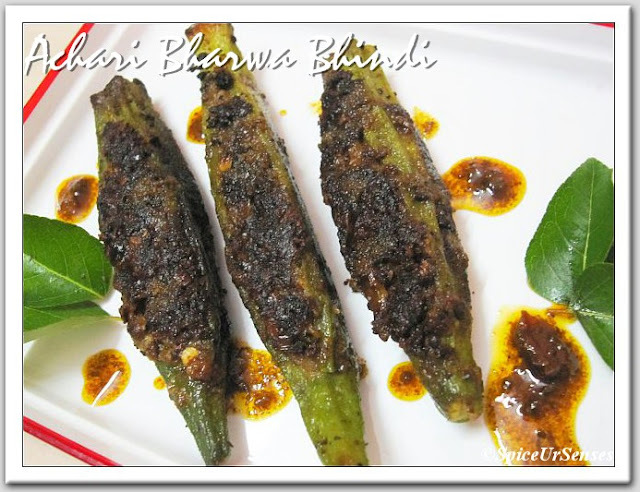 yummm...mouthwatering bhindi...a complete bringing together of flavours. interesting stuffed okra recipe...you made it perfectly..loved it.. I make something similar and my hubby loves it. Btw lovely pictures and loved your styling too.